Darrian Robinson left for Batumi, Georgia on today for the 2006 World Youth Championships in what is her biggest tournament to date. The tall and slender 12-year old will certainly make her presence felt and will no doubt follow the path of another New Yorker, 15-year old Medina Parrilla (and a couple of others from the 1980s). Unfortunately, Medina will be unable to participate due after having qualified for the a spot. More on this later. Darrian and her mother Cenceria Edwards headed out of New York for a long flight to Turkey for a connection and then board a flight to Georgia. Darrian traveled to Cuenca, Ecuador for the 2006 Pan-Am Games so she has some international experience going into the tournament. The raising of funds to support Darrian was a major challenge for Edwards, but after countless calls and pleas for assistance, she was able to find funding for Darrian's inaugural visit to the World Youth. Edwards told The Chess Drum that she hopes to find a suitable environment for Darrian to get the proper training she needs to improve. 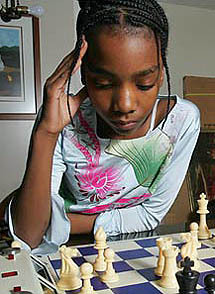 Thus far Darrian has received assistance from NM Jerald Times, GM Maurice Ashley and her primary coach, GM Miron Sher. The Chess Drum will follow her progress in Batumi and will post photos as they become available. The case of Medina's absence is quite a setback given her well-deserved efforts. Excitement was high after Jennifer Shahade wrote an article for the USCF site detailing a training session for both Medina and Darrian with GM Ashley. Medina, a two-time World Youth participant, was provided with funds to travel, but there were no funds provided for her mother (as in previous years). Medina refused to travel without her mother, Luz Parrilla. After the New York Times article and a massive e-mail campaign explaining the dilemma, 40 persons called with pledges (including an offer to cover mother's expenses) and it appeared there may be a chance. However, the shortness of time did not allow Medina and her mother to make the arrangements since they would have had to settle the expenses immediately in cash. 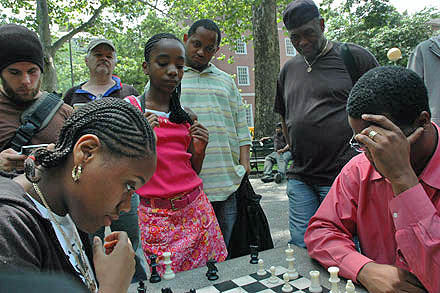 At the 11th hour, Medina's mother called The Chess Drum's Daaim Shabazz (who had run a fundraiser) and stated they would be unable to make the trip. This would have been the first time two girls of African descent represented the U.S. in the World Youth. Medina, 15, is ranked No. 7 in the country among girls under 16 and Darrian, 12, is No. 6 among girls under 13. What a shame that the support was late and what a big indictment on the Black community for not providing help when needed. Medina Parrilla blitzes with GM Maurice Ashley while Darrian Robinson (in the pink) looks on with other spectators. Photo by Jennifer Shahade.